Marian Blazes. The Spruce Eats, 2017. Yield: Serves 4 as side salad. Servings: Serves 4 as side salad. Ensalada chilena is quite popular in Chile, probably because it's so simple to make and goes well with many different things. 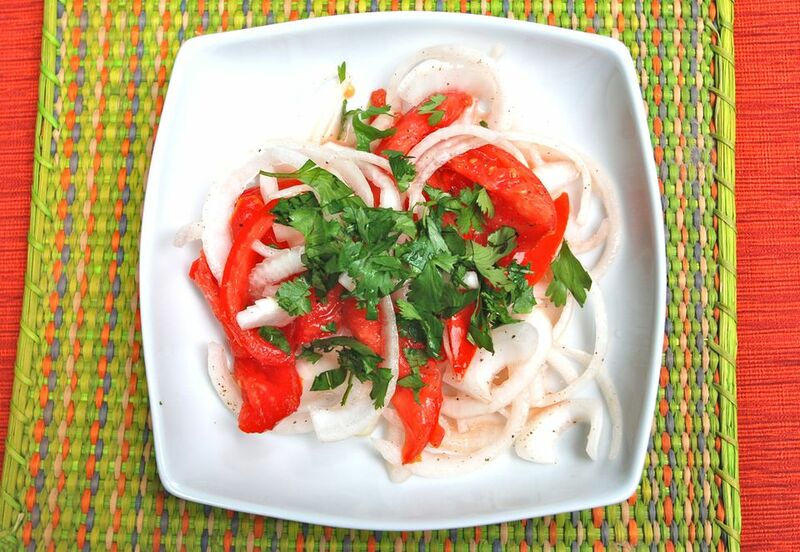 This salad is similar in appearance and preparation to the Peruvian salad salsa Criolla, except that the Chilean version has tomatoes. Like salsa Criolla, the onions should be thinly sliced "a la pluma" style (like feathers), and soaked in salt water for a bit to soften their intense flavor and sweeten them. Serve ensalada chilena alongside grilled meats, empanadas, or milanesas with rice. Diced avocado makes a nice addition to this salad. Peel the onion and slice it in half. Place each half cut side down, then carefully slice the onion crosswise into very thin half-moon slices. Place onion slices in a bowl of salted water and let them soak for about 20 minutes. Drain onions in a colander and briefly rinse them with fresh water. Pat dry with paper towels. Chop the tomato and place in a bowl. Add the juice of 1 lime and the olive oil. Add the onions and toss everything together well. Taste for seasoning, adding more lime juice if desired and seasoning with salt and pepper to taste. Arrange salad decoratively on a plate. Garnish with chopped cilantro. The salad can be covered with plastic wrap and stored in the refrigerator for up to 12 hours. How Do You Make Delicious Llapingachos, Ecuadorean Potato Pancakes? A Delicious Chilean-Style Salsa With Chili Peppers and Cilantro.